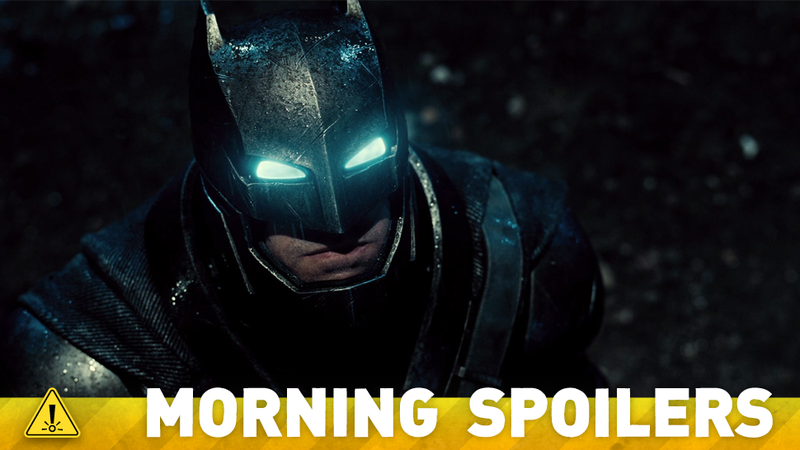 We May Not See All Of Batman v. Superman Until The Epic Director's Cut! The Flash movie is in a totally different universe to the Flash TV show. Not all of Doctor Who’s next season may air next year. Ghosts in the Shell casts an upcoming Game of Thrones actor. Plus, leaked Game of Thrones script extracts, more X-Files pictures, and Doctor Strange story details. Behold, Spoilers! You will definitely understand when you see the movie why we call it Batman v Superman… I’m excited to have people see it. I think it’s really a wonderful film. I think Zack [Snyder]’s done an amazing job, all of the actors who are in it, we were so lucky. Just think about the cast that we have, from Ben [Affleck] to Henry Cavill, to Amy [Adams] to Jesse [Eisenberg] to Jeremy [Irons] to Larry [Laurence] Fishburne. Just amazing, and they all really bring it. Really great. Very happy. Honestly, you’re going be seeing something very soon… I don’t know how you define soon, but certainly before the end of the year, how about that? I don’t know if you’ll ever get the 4-hour version, but there may be something that’s coming along that might be slightly less long than that. Four hours of Batman v Superman? Holy moly. Whether it’s The Flash or Arrow, they’re doing a great job with the TV shows they’re doing. Gotham, that show’s really terrific. And we obviously wish them the best. It’s gonna be interesting to see what happens when we have a different Flash in a different universe. We’re gonna try to stay in our universe and they’re gonna be staying, I think, in their universe, and hopefully the audiences will embrace both. I think they can. Latino Review claim to have details about the film’s opening story beats. The film allegedly opens in 1968 Kathmandu, as cultists led by a man named Kaecilius (a character related to Baron Mordo in the comics) open a portal to another dimension. The film then flashes forward to the modern day with Stephen Strange performing an operation on a gunshot victim, before an accident in his car severely damages his hands. Following failed surgery, an encounter with magic will see Strange travel to Nepal in search of training that might help his hands recover. I was talking to [Paul] Rudd about it the other day. We’ll see what happens, but that would certainly be fun. I loved working with Marvel. And I have a couple of projects in development. One of them is more dramatic, one’s more comedy, still with a little bit of political teeth to it. And there’s a TV show idea I’ve been kicking around. The 11th episode of the season will be called “AWOL”. EW are reporting Victoria Smurfit will reprise her role as Cruella De Vil throughout the second half of the current season.